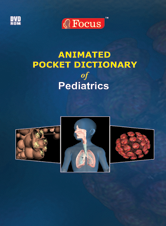 The FOCUS Animated Pocket Dictionary of Pediatrics, the first ever animated dictionary in the subject, is a comprehensive reference source for the definition of terms related to the Pediatrics, and the diseases and disorders affecting the children. A must-have resource for physicians and students who would greatly benefit from this module, it covers 120 related terms and definitions. All the definitions have been graphically described with breathtaking, state of the art 3D animations making learning more exciting.